Prior to this publication, the biting fly Haematobosca zuluensis (Zumpt, 1950) (Diptera, Muscidae, Stomoxyinae) was known only from a single male specimen collected in 1923 in Zululand, South Africa. Seven additional males were subsequently captured in the Kruger National Park of South Africa, one in 1984 and six in 1991, but remained unidentified until now. The genus includes species of considerable veterinary significance, but current keys for identification of species are misleading due to inadequate description of H. zuluensis. External morphological features are described to enable species characterization, including intraspecific variability. This paper confirms the existence of H. zuluensis, expands its known range, provides a full description of males of the species, and gives an up to date set of keys for the 15 known species within the genus. Available records suggest that Haematobosca zuluensis is a low density species as yet known only from wildlife areas of South Africa. The additional specimens of H. zuluensis have enabled an improved description of the species and an improved set of keys to identify constituent members of the genus. Based on a single male specimen caught by R H Harris in February 1923 in northern KwaZulu-Natal Province (previously known as ‘Zululand’), South Africa, Zumpt  initially described the fly as Haematobia zuluensis, but in his 1973 monograph placed it in the genus Haematobosca. No other specimens of the species have been recorded since 1923, until this publication. Taxonomic treatment of the genus Haematobosca has remained remarkably stable since the 1973 monograph by Zumpt, with only two new species described since that time, H.croceicornis from Gabon, and H. aurata from Kenya; H. alcis has also been recognized as a good Holarctic species . One of us (Braack) in January 1984 collected one male Haematobosca near Tshalungwa Spring, and in March 1991 six more males close to another nearby freshwater spring, Magovani, both sites located in the northern region of the Kruger National Park, South Africa. 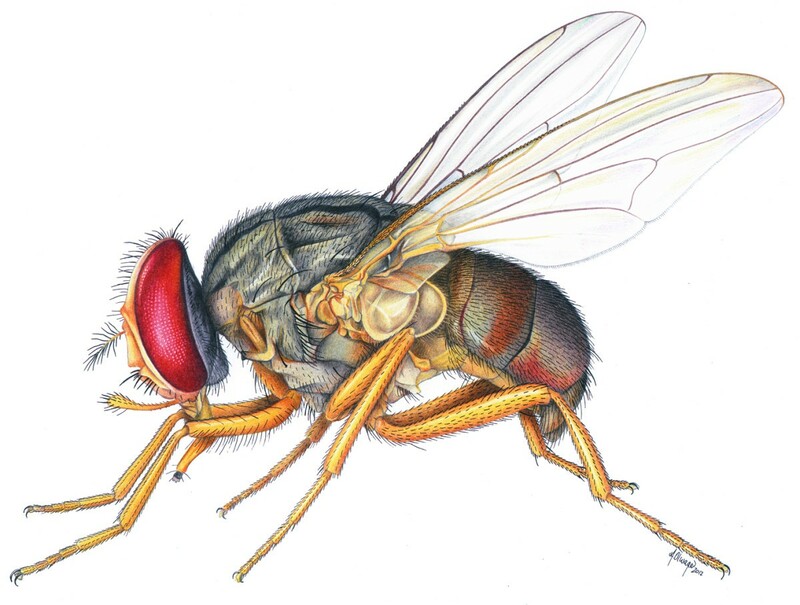 Initially these flies were considered a new species because of perceived differences with the written description of H. zuluensis by Zumpt , but they were not described and published in the hope of finding females for a comprehensive description. Despite fairly intensive collections of biting flies as part of routine parasitological work in Kruger National Park over two decades, no additional specimens of this species were captured. Recent re-examination of the Kruger Park specimens and comparison with the type specimen of H. zuluensis, suggests that they belong to the same species; earlier doubts had been based on intraspecific variation in some features used in the 1973 key provided by Zumpt. Pont & Dsouli  developed a new set of keys for the separation of Haematobosca species, but without having access to the H. zuluensis type specimen the keys were misleading and H. zuluensis was not keyed out correctly. Because of the intraspecific variation in some morphological features used in the keys of Zumpt  and Pont & Dsouli , the species is re-described below and a revised set of keys provided. Pinned, dry specimens of the seven flies collected in Kruger National Park, and the holotype specimen, all examined under stereoscopic microscope, formed the basis of the descriptions below. Eyes large, red, with small uniformly-sized facets across entire area bearing no setulae/microtrichiae; hind margin of eye slightly concave in the lower half; large median ocellus and two smaller posterior ocelli, all red (except in specimens initially kept in ethanol, following which ocelli turn opaque); frons black; parafacial dark orange; fronto-orbital plate as well as parafacial and facial ridge with shiny silver pruinosity when viewed with a particular angle of light; antenna bright yellow-orange, except for basal one-third of arista which is slightly darkened in some specimens (but still essentially orange); gena black but suffused with an underlying dark orange hue which becomes more dominant in the vibrissal area; oral margin orange; palpus orange with multiple stout, dark setulae distally; proboscis orange but with blackened tip. Ground colour of scutum black but overlaid with a silvery-grey pruinosity; two sets of prominent black vittae on the presutural part of scutum, one being a pair of narrow medial lines traversing the entire length of the presutural area (and continuing postsuturally but narrowing to become indistinct when reaching scutellum), each of these medial lines adjoined laterally by a slightly thicker short oblique line which commences midway along the presutural scutum and curves inwards towards the medial pair of vittae, tapering rapidly and fading away before reaching the suture; in the postsutural area, midway between the two medial lines, a single thick black vitta stretching over the distal half but fading away before reaching the scutellum; anterior spiracle orange; posterior spiracle appearing black but the adjoining sclerites suffused with an underlying dark orange hue; proepisternal depression bare; postpronotal lobe covered medially and ventrally with approximately 30 moderate-sized setae, but three prominent setae dorsally; several stout proepisternal setae (sometimes obscured by attached phoretic mites); katepisternum with 2 stout setae, one anterior and one posterior, and a liberal sprinkling of finer setae along the hind margin; proepimeral seta present; meron bare; notopleural bristles 1:1. Clear, with no infuscated areas; basicosta and tegula orange; anterior costal margin fringed with setulae along entire length; vein R1 bare except in one specimen (Tshalungwa) which has a single dorsal setula close to the junction with costa; vein R1 with no setae ventrally; vein R2+3 without setulae; vein R4+5 dorsally with three or four widely separated setulae before junction with cross-vein r-m (but completely absent in three specimens); cell r4+5 at wing-tip wider than length of cross-vein r-m; vein M curved forward towards vein R 4+5 in terminal part; cross-vein dm-cu clearly concave; both calypters pale orange; haltere orange. All segments of all legs yellow-orange, covered with black setae, except for apical tarsomeres of fore and hind legs which are slightly darkened in some specimens; fore tibia without submedian seta, but with two stout setae posteriorly at distal tip; mid-tibia with one posterior seta sub-medially, located between the two rows of finer setulae running lengthways down ventral tibia; mid-femur with two or three stout setae posteriorly close to distal tip; hind femur with one stout anteroventral seta a short distance from junction with tibia; hind tibia usually with one stout seta ventrally at distal end; hind tibia usually with one posterior submedian seta (present in five, absent in two); in at least some specimens, hind tibia also with one long ventral hair clearly longer and thinner than any of the other tibial setae. Ground colour grey/black but suffused by a dark orange hue in the anterior two tergites (in some specimens all tergites with dark orange hue). (based on 5 specimens): Width of head 1.88mm - 2.10mm (viewed dorsally, outer edge of one eye to outer edge of the other eye); depth of eye 0.58mm - 0.88mm (viewed dorsally, anterior to posterior margins in region of greatest depth); length of postpedicel 0.38mm – 0.48mm; width of thorax in postsutural area 1.90mm - 2.38mm (dorsal view); length of thorax from anterior margin to distal tip of scutellum 2.88mm – 2.96mm; width of abdomen in area of greatest extent 2.25mm – 2.89mm (viewed dorsally); length of abdomen 2.38mm - 2.85mm (dorsal view) Figure 1. Lateral view of Haematobosca zuluensis (Zumpt). zuluensis is recorded from South Africa, geographically far removed from the known distribution of croceicornis in Gabon. There is definite variation between specimens ― clearly belonging to the same species ― in the morphological traits used by Zumpt  and Pont & Dsouli  for keying out individuals of Haematobosca to species level, resulting in those keys being of limited use, at least for identifying H. zuluensis. As an example, one of us (Braack) examined a specimen of H. squalida (Natal Museum, South Africa) identified by Zumpt himself, which according to his 1973 keys should have 3–5 ventral hairs on the hind tibia, but they are absent in this particular specimen which nevertheless by all other features qualifies as a true H. squalida. From the description of H. croceicornis by Pont & Dsouli (2008), it is clear that considerable variation occurs in the setulosity on the branches of the radial veins. Wing-vein R1: The Tshalungwa Spring specimen has one setula distally on the dorsal length of the vein, whereas none of the six Magovani specimens have any setulosity on R1. The 1923 holotype specimen has been damaged over the years: the anterior portions of both wings are completely broken away and lost (as also one mid-leg completely broken away). The key provided by Zumpt  suggests that distally vein R1 is bare in H. zuluensis, thus corresponding to the Magovani specimens. Wing-vein R4+5: The Tshalungwa specimen and two of the five Magovani flies have no dorsal setulae along the entire length of the vein; in the other three flies there are three or four clear setulae dorsally in the proximal part of the vein before crossvein r-m; vein R4+5 in the 1923 holotype is described in Zumpt  as being the ‘…same as in H. squalida’, thus implying it to be ‘…partly setulose’, again in agreement with at least some of the Magovani specimens. Most importantly in terms of ability to use either the Zumpt  or Pont & Dsouli  keys, only one fly (from Magovani) has a long ventral hair on the hind tibia; none of the other six have such a hair. In the specimen which does have the hair, it differs clearly from the submedian setae elsewhere on the hind tibia, by being thinner and longer, and is located anterodorsally two-thirds down the length of the tibial shaft. This hair is clearly visible in the holotype. In the holotype, and two of the Magovani specimens, the basal part of the arista is as yellow/orange as all the other segments of the antenna, whereas five other specimens have the basal part of the arista slightly darkened. Zumpt  states that the abdomen of the holotype specimen is broader than long; re-examination of the holotype reveals that the particular specimen has the abdomen in-curved ventrally, making it very difficult to measure; this brings some doubt to the interpretation by Zumpt that the abdomen is broader than long. In the Kruger National Park specimens, those measured had the abdomen slightly longer than broad. Useful to note is the consistency of two features across all specimens, one being that the postpedicel is clearly and completely yellow-orange throughout its length, and the other is that the posterior crossvein (dm-cu) is clearly incurved. Any doubts regarding possible differences between the Zululand holotype and the Kruger National Park specimens should be considered within the context of the variation between specimens caught even at the same site (Magovani Spring), the intraspecific variation observed within other species of the genus, and most importantly the relative geographic proximity of Zululand and northern Kruger National Park. Haematobosca zuluensis appears to be a rare, low-density species, probably encouraging some degree of genetic drift. The 1923 holotype male is deposited in the insect collection of the Biosystematics Division of the Plant Protection Research Institute, Agricultural Research Council, Pretoria. Anterior portions of both wings fairly extensively damaged and one mid-leg lost. One male, Tshalungwa Spring (S22o3240; E31o0150), Kruger National Park, South Africa, caught (Braack) with hand net 26 January 1984, plus one male Magovani Spring (S22o3537; E31o0043), Kruger National Park, South Africa captured (Braack) 5 March 1991 using Malaise trap with 70% ethanol as collecting medium, subsequently pinned and dried; in collection of Biosystematics Division, Plant Protection Research Institute, Agricultural Research Council, Pretoria. Five male specimens, captured (Braack) Magovani Spring (S22o3537; E31o0043), Kruger National Park, South Africa, ) 5 March 1991 using Malaise trap with 70% ethanol as collecting medium, subsequently pinned and dried ; in Insect Collection of Kruger National Park Research Department, Skukuza, Kruger National Park, South Africa. We thank Mrs Guin Zambatis, Curator of the insect collection in the Kruger National Park, for use of the Haematobosca specimens in that collection, and also Mrs Rosalind Usher for access to the H. zuluensis holotype at the Biosystematics Division (PPRI, ARC) in Pretoria. Our particular thanks to Andre Olwage for the excellent illustration, as always a technical masterpiece. LB conceived the need for the paper, undertook the microscopic and descriptive work as well as wrote the initial draft. ACP conducted the literature search, provided expert taxonomic editing and tracked down the location of the holotype. Both authors read and approved the final version of the manuscript.